•	Customers living in the United Kingdom will be able to take advantage of free standard delivery on all orders to be shipped to addresses in the United Kingdom. Express and overnight shipping options are available as well, with international orders also capable of being placed on this website. 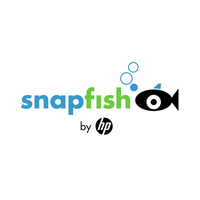 •	Take advantage of the free email newsletter published by SnapFish. Email newsletter members will get special access to coupon codes, exclusive deals, and other discounts on a regular basis. Many of these offers will not be shared with non-email newsletter subscribers. •	Find exclusive deals, offers, and discounts of good for up to 50% or more off of traditionally advertised prices in the SALE section of the website. Creating personalized gifts is a great way to show someone that you care and Snapfish is an online service that helps customers create their own personalized photo books, wall art, prints, calendars, cards, and other types of photo gifts. When you visit their website you will be able to create an account where you can upload your own photos and choose the item that you want to customize. The company will then print it out for you and ship it to your desired address. There are hundreds of items that you can create to make it your own as you can see via the drop down list on the right side of their home page. For most up to date offers check out Snapfish UK on Facebook and Twitter or contact Snapfish UK Support for any questions.